Join the Missouri Association of Recycling (MORA) and the Composting & Organics Association of Missouri (COAM) for this annual conference September 10 through 12. Sessions will cover composting, Constructionn & Demolition Waste, recycling 101, storm debris management and more. Tours will visit the Missouri Botanical Garden and Busch Stadium as well as a St. Louis Composting’s largest facility. 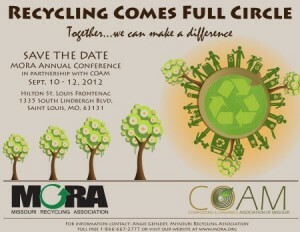 MORA’s Annual Conference will be at the Hilton St. Louis Frontenac. Learn more or register at www.mora.org. ReSource St. Louis and St. Louis County are seeking applications & RFQs for a Construction & Demolition Waste Diversion Pilot Project by January 31, 2012. The Pilot Program seeks to demonstrate that C&D waste diversion is the best-practice solution for a sustainable, economically viable community and will serve as a basis for vital, ongoing education and training accessible to the entire building industry. Two projects will be chosen to participate in the Pilot:a medium-sized (20,00 – 40,000 square feet) construction or remodeling projects and the demolition of a medium to large-sized structure. Do you have a project that qualifies? Download the application here. Applications are due January 31, 2012. One project manager will be chosen to manage the Pilot Project. Think you have what it takes? Download the RFQ here. Quotes are due January 31, 2012. For more information, please contact Chris Kalter with St. Louis County Solid Waste Management Program.